He hadn’t been back to Medicine Hat in six months, so when Linus Nassen arrived at Canalta Centre Tuesday there was a lot of catching up to do. New gear? Got it. Ready for a home game? You bet. Dylan MacPherson? Well, he’d only been gone a couple weeks and lives in Redcliff. Should be easy, right? “Living at home, my parents kind of looked at me when I asked them to do my laundry for me,” he said. “‘You’re 20 years old, you can do it yourself.’” It’s been a chaotic return, but one they’re both happy to handle. With Nassen and MacPherson expected back in the lineup, the Tigers host the Prince Albert Raiders tonight. The Swedish defenceman sounded positively cheery in talking about being sent back to the Gas City by the Florida Panthers after what he felt was a great camp with the AHL’s Springfield Thunderbirds. His goal came in the second period. He felt pretty nervous in the first but calmed down after that. MacPherson didn’t get into either weekend game, and both had a feeling they’d be back in major-junior. The experience was still positive, however. Both veterans know it won’t be the same playing alongside younger, developing players but say they’re ready to lead the way after the Panthers told them to go and get lots of playing time, presumably with the carrot of a pro deal after the season ends. 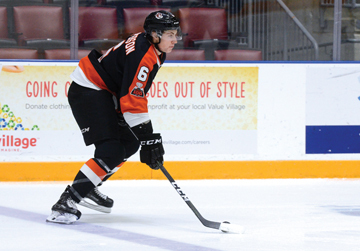 Nassen had one goal to go with 25 assists in 44 games last season, and admits the WHL was indeed tougher than he had expected coming from overseas. “Last year when I got here, if I’m going to be honest I thought it was going to be an easy league,” he said. “I’d seen guys game I realized this is not an easy league putting up 125, 130 points. After my first if you’re not working hard, you have to be on your toes every game and be prepared and ready.